I love Italian food...and nothing beats eating italian food in Italy, right? Well.......maybe eating french food in France? Hmm...that's something I need to think about. But that's for another time. Right now let's talk about food....Italian food, specifically eating italian food in italian restaurants in Rome! There are things one needs to know about eating out in Italy. The most important being that meals are served and eaten leisurely. For Italians, meals are not only about consumption, it is more of a social event, when with friends or a family event, when with family. As such time is set aside, forgotten. So when you sit at a table in the restaurant, a waiter comes along and brings you a menu and then you're given time (a lot of time, for one used to fast food service) to look at the menu, then you order and your drinks are brought and then you wait..... and so on. When you're done, 2 hours could have gone by. The next thing to be aware of is that italians eat late, lunch is usually between 1 and 3 or 4 in the afternoon and dinner may start at around 8 or 8:30 and go on until 11 or later. Most restaurants open at 12:30pm to 1:00pm for lunch and 7:30pm to 8:00pm for dinner. The first is the antipasti which is made up of hot or cold appetizers, like melon wrapped with prosciutto, beef carpaccio, olives, parma ham with figs, marinated vegetables and many more delicious items like these. This is followed by the primi piatti which most often will be a pasta with a sauce, or a risotto, sometimes gnocchi (dumpling), or polenta or maybe even soup. The secondo piatti is the main course, either meat, fish or seafood. Side dishes of potatoes or a salad or some other vegetable can be ordered or are served with this course. Then, the not to be missed part, the dolce or dessert, which can be a fruit, cheese, ice cream, and countless sweet concoctions. This is followed by coffee and then a digestivi, a liquor which as the name suggests, supposedly aids digestion. The meal is accompanied by wine and lots of it. ( I am amazed by how relatively inexpensive wine is here!) You are of course free to skip the antipasti and the primi piatti and go straight to the main course, but you would be missing what may at times be the better part of the meal. What we have tried doing here is to eat the "chinese way", which essentially means "sharing" a dish. On one occasion, there were four of us, so we had three orders of each course. The waiters kindly provided extra plates and utensils which made the sharing easier. We have eaten in a lot of restaurants since we've arrived. Many of them memorable, some others, mainly tourist traps. Here are some of the more memorable ones, with a recollection of our experiences and reactions while eating there. We were invited by an Italian friend from Sienna to eat at this restaurant. We took Metro Line A from Termini, and got off at the Flaminio stop right at Piazza del Popolo. We had a drink at Rosati, a bar on the Piazza, and then walked up a long flight of steps to the Pincio terrace which afforded us a fantastic view of Rome, including St. Peter's Basilica. The Casina Veladier is a very upscale place, very close to the Pincio Terrace and is considered a watering hole by politicians, rock stars and the rich and powerful, or so we were told. The service was definitely impeccable. Thinly sliced zucchini stuffed with ricotta and zucchini blossoms stuffed with tomatoes was my antipasti. Decided to skip the primi piatti and and went directly to the main course, turbot baked in salt and served with spinach (this was very good!). Dessert was a chocolate dome with coffee mousse and a vanila bean at the center. We had a Montepulciano L'Abruzzo with the meal and finished it off with an espresso. Overall a good meal but rather expensive. What was most memorable was the view from the restaurant. Would we go back to this restaurant? Yes.....if only for the view. On the other end of the restaurant scale is a very charming mom and pop operation. At this place there is no menu, you simply eat what they have for the day and their house wine is literally made in-house. Cooking responsibilities have been passed from Ada to her grandaughter, a very attractive, young lady. First time we ate there was for dinner. It's a small restaurant on Via Banchi Nuovo, a small road adjoining the Via B. S. Spirito which is directly connected to the Ponte Sant' Angelo, the bridge leading straight to the Castel Sant' Angelo. Our waiter, a rotund man with a ponytail and a sense of humor (his response to our statement that we didn't speak Italian: "Me too I speak Roman"), comes around to the table and asks, "red or white?" My husband responds, "Huh?" "Wine, what wine?" "Ah! ", my husband enlightened answers, "Red". "Cream sauce or tomato sauce?" My reply, "ah?" "What sauce do you want for your pasta? ", he clarifies. And so it went on. My very reasonably priced meal was spaghetti with a spicy tomato sauce, followed by veal scallopini (choice of veal or beef) and finished with some italian biscuits for dessert. This was accompanied by a carafe of red wine dispensed from a cask on a niche in the wall. Since then, we have gone back for lunch and we'll be bringing our girls there when they come to visit. This restaurant is located in the Jewish quarter, on Via del Portico D'Otavio, which ends at the ruins of Teatro di Marcello. One sees the ruins of the Portico d'Ottavia, a gate built by Augustus to honor his sister, Ottavia, whom he married to Mark Anthony in hopes of cementing an alliance between them after Julius Caesar was assasinated. And of course we all know what happened after, Mark Anthony left her in Rome and joined Cleopatra in Egypt. Giggetto's menu focuses on traditional Roman dishes. It's signature dish is fried artichokes (carciofi alla guida). On the day we ate there, they had fried filet of cod (filetti di baccala), carciofi della guida and fried zucchini flower as antipaste. We ordered one of each. The zucchini flower was stuffed with ricotta cheese and anchovies. It was delicious and so was the cod. I love artichokes and was very excited to try the fried carciofi. But I was dissapointed, to me it was like eating dried leaves. I prefer boiled artichokes, where you scrape the bottom of each petal with your teeth and work towards the heart. For our main dish, we ordered 2 other "specialities of the house", fried lamb's brain and osso buco. 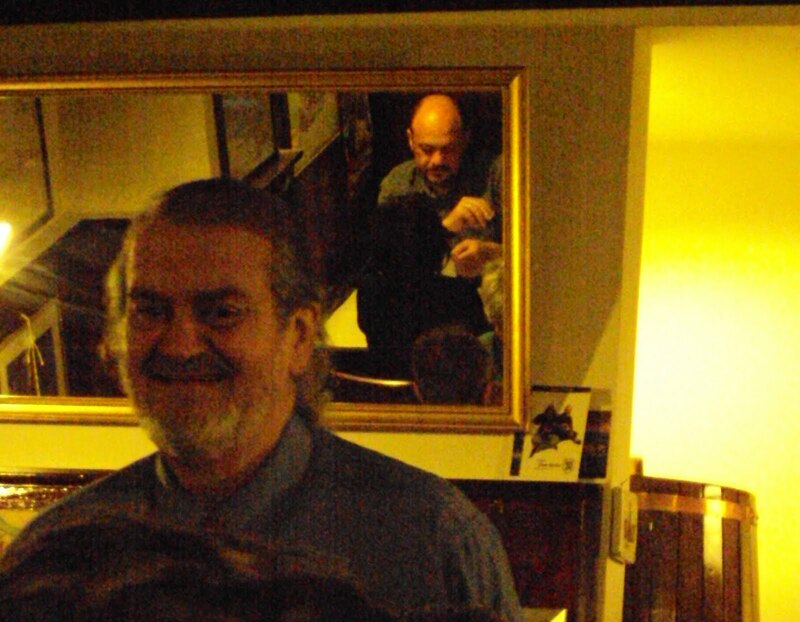 The osso bucco was very good, as for the lamb's brain.. ...? So would I return to this restaurant? For the baccala and the zucchini flowers? Definitely! Since we've arrived in Rome, our Sundays have been quiet affairs, giving the hubby time to de-stress and relax. Don't really know how relaxing going to the grocery is....but if that's what he wants to do, a dutiful dependent spouse like myself just goes along. This Sunday, however, taking him at his word that he would leave it up to me to decide, I suggested going down to Rome, attend church wherever, after which we would explore the area and finish it off with lunch (with emphasis on the lunch). Knowing that I would be given the task of finding a small but interesting area, I decided on the Monti neighborhood. This neighborhood was nowhere in my top lists of places to explore until it came to my attention that this was an ancient residential neighborhood, once called the Subura and was renamed Rione Monti in the middle ages because it was located at the juncture of the Viminale, Qurinale and Esquiline Hills. Subura! Finally finding the Subura was exciting for one like me who reads Saylor, Davis, Massie and Everett, authors who through their books evocatively recreate a city that no longer exists. Ancient Rome would not be complete without the Subura! Getting off the Metro Line B at Cavour, one exits right into the middle of Rione Monti, the Subura of ancient Rome! 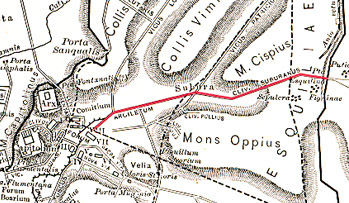 In ancient Rome, the Subura was a district in central Rome, east of the Forum, lying between the Virminale and Esquiline Hills. It was a busy, noisy area, home to traders and manufacturers as well as to thieves, prostitutes and the poor. The presence of "foreigners" was notable, and there was most certainly a Jewish place of worship somewhere in the Subura. The wealthy, aristocratic Romans stayed away from this area of narrow alleys, and most ordinary Romans would not venture into certain parts of the Subura especially at the onset of darkness. It was a tough neighborhood, the ancient city's red-light district and was mostly controlled by gangs. It was also a place of commerce, teeming with merchants, barber shops, cobblers, coppersmiths, blacksmiths and had a large market were vegetables, wine, meat and other provisions could be found. Customers were the residents of the Suburba, the poorer residents of other parts of Rome, and the slaves in charge of households who knew where the bargains could be had. Some may have been shopping there with the full knowledge of their masters, others may have been doing it on the sly, maybe keeping the balance of market money towards their "purchase my freedom" fund. In 2 BC to act as a firewall and visual barrier between the "unsightly" Subura and the "glorious" Forum a massive grey wall was built, parts of which are still visible today. Although shunned by the aristocrats and the rich, there was one notable resident of the Subura. 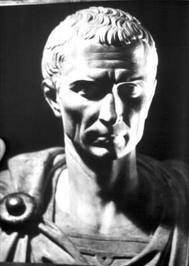 Julius Caesar grew up and stayed there until he became Pontifex Maximus. Caesar's pedigree was impecable, and could rival anyone living on the Aventine, or the Palatine and maybe surpass a number of them. He was a member of the Julii clan who claimed descent from Iulus, son of the Trojan prince Aeneas (of Odyssey fame) and himself the son of Venus the goddess of love. How much more impecable can a pedigree be? His cognomen, Caesar depending on which historical account you're reading could have come from either of these three reasons; an ancestor was born by caesarian section, an ancestor had a rather full head of hair, or an ancestor had killed an elephant. Despite their ancient pedigree, the Julii were not particulary politically powerful. Some authors like to point to Julius' or more specifically his mother, Aurelia's republican sentiments when mentioning that they lived in the Subura, but it is more than likely that, Julius' family home had been in the area of the Suburba before the Suburba began to expand around it. 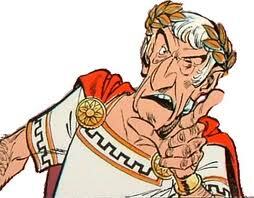 And admire him or not, Julius Caesar's ascent to power did sound the death knell of the Roman Republic. ﻿ Today, the Monti district is a hip place, with it's charming cobble stoned tiny alleyways, boutiques and wine cellars. It is a rather small area as 30% of it was flattened by Mussolini to build the very wide Via dei Foro Imperiali. ﻿﻿﻿﻿The neighborhood's ambiguous character is seen in the mix of modern and expensive condominiums and stepped backstreets of cramped "palazzi" one of them, with a vivid red and yellow mural of footballer Totti right on the wall of the dead end street. Bars advertising "Happy Hour" are a stone's throw away from the Church of Santa Maria dei Monti. Making clear that this neighborhood evolved, unplanned to what it is today, and still retaining some character of it's ancient past. A market, the Mercato Rionale is still operating in Monti, harking back to the Subura of ancient times, thus upholding centuries of tradition. We attended mass at The church of Santa Maria dei Monti or as it is also called, church of the Madonna dei Monti, right at the end of Via Serpenti. This church was designed by Giacomo della Porta, who also worked on the Jesuit church, The Church of the Gesu. Right across the church on Via Serpenti, is a chinese restaurant, Pace. Strategically placed as we were starving by the time the mass ended. As luck would have it, the food was actually the best chinese food we've had so far here in Rome. As we sat in this chinese restaurant eating our steamed spigoleto, a fine tenor's rendition of "O Solo Mio" drifted in from the piazza﻿﻿. "Appropriate", I thought to myself, "after all we are in the Subura!"